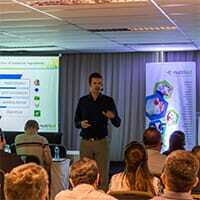 BRAZIL - On March 30th Nutriad organized its third annual Technical Symposium in Florianopolis (SC, Brazil). At the event Nutriad experts and external speakers introduced new insights and novel solutions for gut health, feed intake and mycotoxin control. Hosting more than 50 professionals from all over Brazil - including veterinarians; nutritionists, plant managers and farmers – for three days the symposium once more proved an excellent opportunity for industry leaders to learn from experts and from each other. Simon Eskinazi (Technical Manager Palatability) and David Jacob (Technical Manager Nutriad Brazil) discussed how palatability solutions can optimize the feed intake across all species and allow producers maximum flexibility on selection of raw materials. Dr. Olga Averkieva (Business Development Manager Nutriad) presented on how Feed mycotoxins decrease vaccine efficacy, a challenge for producers worldwide. Dr. Elisabeth Santin (Universidade Estadual do Paraná) explained the impact of mycotoxins on intestinal health and Dr. Eduardo Micotti (Universidade de São Paulo) discussed on the importance of proper mycotoxin management for feed mills. The final day of the program dedicated to Digestive Performance. Essential oils applications in poultry and swine nutrition were discussed by Dr. José Henrique Stringhini (Universidade Federal de Goiás); Tim Goossens (Business Development Manager Nutriad) presented studies on Quorum Sensing and the mode of action of Sodium Butyrate and Dr. Javier Hernandez (Technical Director Disan) showed the results of his research on the effect of Sodium Butyrate on the Ecophysiology of the gastro intestinal tract.